Spinal infections caused by Parvimonas micra are rare, but can be successfully treated according to the guidelines for spinal infection. Department of Orthopaedic Surgery, MOVE Research Institute Amsterdam, VU University Medical Center, Amsterdam, The Netherlands. Orthopaedic Spine Surgeon, Department of Orthopaedic Surgery, MOVE Research Institute Amsterdam, VU University Medical Center, PO Box 7057, 1007 MB, Amsterdam, The Netherlands. Introduction: Treatment and risk factors for Parvimonas micra spinal infections are scarcely researched. This study reports a case and presents a systematic review of the literature to provide evidence-based ground for diagnosis and treatment of P. micra spinal infections. Case Report: This is a case of a 78-year-old male with severe back and leg pain. Advanced imaging demonstrated the destruction of L2-L3 with an extensive fluid collection in the remaining intervertebral space, paravertebral myositis, and multiple abscesses. A decompression of L2 and L3 and a posterior spondylodesis from T12 to L5 was performed. Intraoperative cultures showed P. micra. The postoperative treatment consisted of intravenous penicillin for 2 weeks and subsequent oral clindamycin for 4 weeks. At 1-year follow-up, the patient was in good health and reported only occasional back pain. Conclusions: A total of 15 additional cases of P. micraspinal infections were identified. The antibiotic treatment showed a great variety in the treated patients. Nevertheless, the outcome of these patients was good concerning relapse of the infection and pain. Spinal infections caused by P. micra are rare, but can be successfully treated according to the guidelines for spinal infection. Keywords: Spinal osteomyelitis, Spondylitis, Spondylodiscitis, Parvimonas micra. Bacterial infections of the spine are broadly categorized into vertebral osteomyelitis (spondylitis), spondylodiscitis, or epidural abscess. A mortality of up to 20% due to these infections is reported . Bacterial spondylodiscitis and spondylitis are commonly caused by Gram-positive aerobic bacteria, specifically Staphylococcus aureus, with a reported incidence of up to 80% . Other commonly reported pathogens are Escherichia coli (a Gram-negative aerobic bacterium) and Mycobacterium tuberculosis . Anaerobic bacteria, such as Parvimonas micra, are uncommon as causative pathogens in spinal infections. P. micra, a Gram-positive anaerobic bacterial species, is commonly found in the oral cavity and the gastrointestinal tract . It is commonly recognized as an important oral pathogen [3, 4], however, it is very rare in spinal infections: No cases of spinal infections are described outside Australia, France, Spain, Japan, and the USA [5, 6, 7, 8, 9, 10, 11, 12, 13, 14,15]. To the best of our knowledge, no thorough literature review of this rare cause of spinal infection (e.g., spondylitis, spondylodiscitis, or discitis) has been previously performed. This study provides a systematic review of the literature to identify clinical, microbiologic, and radiographic features of the infection, and outcomes after antimicrobial treatment of P. micraspinal infections. The review is preceded by a report of the first published case of P. micraspondylodiscitis in the Netherlands. A 78-year-old male patient was referred to our tertiary, university hospital outpatient clinic with pain in his right leg. His medical history included a laminectomy of L3-L5, performed 1.5 years before his current visit, because of spinal stenosis as a result of degenerative scoliosis. This procedure was followed by the collapse of the vertebral bodies of L2 and L3 with compression of the right nerve root and spinal stenosis at L3. There had not been any wound problems or other complications after the first procedure. Further medical history included bilateral total hip arthroplasty, revision of the left hip arthroplasty after 19 years, left total knee arthroplasty, hypertension, and ulcerative colitis (without medication). The physical examination showed a lumbar scoliosis with a painful and slightly reduced range of motion of the spine whereas the sacroiliac and hip joints showed a pain-free and normal range of motions. The knee and Achilles tendon reflexes were lower on the right side. Sensation and motor function were normal. The radiographs (Fig. 1) and magnetic resonance imaging (MRI)(Fig. 2) showed degenerative scoliosis with the apex on L2-L3 with the collapse of the vertebral bodies of L2 and L3. Serum markers for infection, 2 months before the presentation at our clinic, were as follows: C-reactive protein (CRP) <1 mg/L, leukocytes 8.8 × 10 e9/L, and erythrocyte sedimentation rate (ESR) 12 mm/h. To exclude a possible spondylodiscitis, as a cause of the sudden vertebral body collapse a positron-emission tomography-computed tomography scan was performed, which showed no clear signs of infection but severe degeneration at level L2-L3 (Fig. 3). We planned a surgical decompression of L2-L3 on the right side with a posterior spondylodesis of L1-L5. During the ambulatory waiting time before surgery, the patient’s symptoms worsened. He was unable to walk and stand because of severe pain in the lumbar spine, without signs of neurological impairment. Four weeks before the onset of progressive symptoms, a broken molar was removed during a dental procedure. The patient interview revealed no alternative explanation for his worsening condition. He was admitted to the hospital, and the date of surgery was advanced. Serum infection markers showed a CRP of 174 mg/L, leukocytes of 11.9x10e9/L, and ESR of 128 mm/h. A new MRI scan showed the previously seen destruction of L2-L3, with an extensive fluid collection in the remaining intervertebral space, paravertebral myositis, and multiple abscesses (Fig. 4). Based on the new clinical situation, a decompression of L2 and L3 and a posterior spondylodesis T12-L5 was performed obtaining deep cultures of tissue and the abscess in the disc space. Vancomycin and ciprofloxacin were started postoperatively. Weakness of the right quadriceps was observed in the first postoperative hours, and a CT-scan (Fig. 5) showed a medial position of both L4 screws. These were replaced by using a revision procedure in the same day. Unfortunately, the weakness persisted in the following weeks. All intraoperative cultures showed P. micra, and the antibiotic treatment was changed to penicillin intravenously (12 g daily) based on the sensitivity spectrum. The pain and infectious signs subsided, and the serum infection markers improved after 2 weeks of antibiotics as follows: CRP 43 mg/L and leukocytes 9.3 × 10 e9/L. The antibiotic treatment was continued orally with clindamycin (600 mg three times daily) for 4weeks. At the last visit to the outpatient clinic, at 1year after surgery, the patient reported only occasional back pain. Blood results as follows: CRP 8 mg/L, leukocytes 8.6 × 10e9/L, and ESR 32 mm/h. Radiography of the spine (Fig. 6) showed unchanged spinal instrumentation and no signs of spondylodiscitis relapse. The PubMed MEDLINE database was systematically searched for studies in English published before February 2017. The following search terms were used: “Parvimonas,” “Micromonas,” “Peptostreptococcus,” “spondylodiscitis,” “discitis,” “spondylitis,” “osteomyelitis,” and “vertebra.”Micromonas and Peptostreptococcus were added to the search terms because Parvimonas was previously known as Micromonas and Peptostreptococcus . In addition, references of all included publications were searched. One reviewer screened the results of the search using the title and abstract of the articles. From this selection, the full text was reviewed to identify the articles eligible for inclusion. All studies describing cases or case series of spondylodiscitis or spondylitis caused by Parvimonas (Micromonas/Peptostreptococcus) micra were included in the study. Studies were excluded if they did not report the full species name (i.e. micra). This was because since 1998, the genus Peptostreptococcus has been divided into several novel genera , which differ from P. micra. The following parameters were retrieved from the studies: Clinical, microbiologic, and radiographic features of the infection, and outcomes after the antimicrobial treatment. The systematic literature search resulted in 18 publications, of which three were excluded based on abstract or title. Full-text versions were retrieved the remaining 15 studies [5, 6, 7, 8, 9, 10, 11, 12, 13, 14, 15, 18, 19, 20, 21], of which 11 were included in the study [5, 6,7, 8, 9, 10, 11, 12, 13, 14, and 15]. Three studies [18, 19, and 20] were excluded because the species was not further specified, and one study  was excluded because it reported a case of Peptostreptococcus magnus. A flow chart is presented in Fig. 7. The included studies are presented in Table 1. 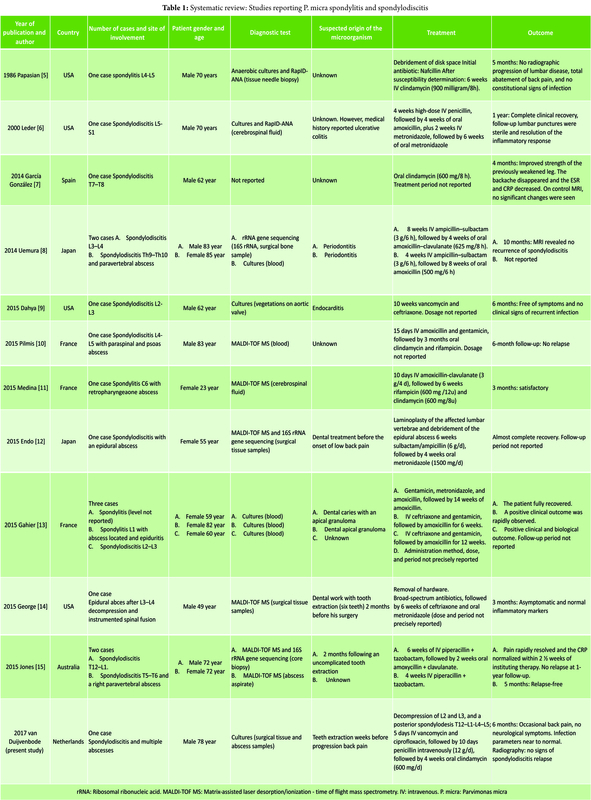 The 11 included studies presented 15 cases in total, and the present study added one more case. Therefore, a total of 16 cases were included in the analysis: Four cases of spondylitis [5, 11, 13], one case of spondylodiscitis [6, 7, 8, 9, 10, 12, 13, 15], and one case of infected instrumented spinal fusion . Nine cases were male, seven were female, and the median age was 70 years (range 29–85). The final diagnosis was based only on culture results in six cases [8, 9, 13, present study], on RapIDANA in two cases [5, 6], on matrix-assisted laser desorption/ionization time of flight mass spectrometry (MALDI-TOF MS) in six cases [10, 11, 12, 14, 15], and on rRNA gene sequencing (16S rRNA) in three cases [8, 12, 15]. A potential-related dental problem or preceding dental procedure was present in eight cases (50%) including the present study. In the case presented in our study and the case presented by Leder et al. , the patient had a medical history of ulcerative colitis. All cases were treated with antibiotics. IV antibiotic agents were administered for at least 10days. Usually, the antibiotic treatment was continued with oral agents. The mean total duration of antibiotic treatment was 9weeks (4–14 weeks). IV antibiotics were mostly of the penicillin group (nine cases) [5, 6, 8, 10, 11, 12, 15, present study] and ceftriaxone (four cases) [9, 13, 14]. Metronidazole was administered in three cases [6, 12, 14]. Oral agents used were amoxicillin (with or without clavulanate) in six cases [6, 8, 13] and clindamycin in five cases including our case [10, 11, 13]. Surgical treatment was reported in three cases. In one case, a disc space debridement was performed , in one case, the hardware was removed after spinal fusion , and in one case a posterior spondylodesis was additionally performed (this study). Duration of follow-up was reported in 12 cases (75%). At a mean follow-up of 6 months (range 3–12 months), five patients had no residual symptoms, ten patients were reported to perform better than at initial presentation, and in one case the outcome was not reported (Table 1). Four studies mentioned serum infection markers [13, 14, 15, present study]. Two studies [7, 8] described the use of MRI for follow-up, and two studies [5, present study] used radiography. In one case , the use of lumbar punctures for follow-up is mentioned. To the best of our knowledge, this is the first systematic review of the literature on P. micra infections of the spine. An analysis of the identified cases in the literature and the additional case from our institution (the first reported in the Netherlands) was performed to identify clinical, microbiologic, and radiographic features of the infection, and outcomes after the antimicrobial treatment. In our case, a molar had been extracted preceding the progression of symptoms of the spinal infection. Of the presented 16 patients with a spinal infection caused by P. micra, eight patients (50%) had a dental problem or had undergone a dental procedure [8, 13, 14, 15, 21, present study]. Hypothetically, there may be an association. This hypothesis is strengthened by the fact that P. micra is a known oral commensal pathogen [3, 4]. On the other hand, common tooth brushing and uncomplicated tooth extraction can also result in bacteremia . As such, an association between the dental procedures and the spinal infection cannot be confirmed because bacteremia with oral commensals can be considered a normal daily phenomenon. In the identified cases, the treatment period varied from a minimum of 10 days to 10 weeks of IV antibiotic treatment in a case with concomitant endocarditis. Over viewing the variety of IV treatment periods and the overall good outcomes of the studies included in this review, we would suggest a treatment period of 2 weeks with IV antibiotics, followed by 4 weeks of oral treatment. The IV antibiotics should start as broad-spectrum antibiotics, which should be narrowed based on the culture. This is in concordance with the general treatment advice on uncomplicated pyogenic spondylodiscitis . No additional long-term beneficial effect of surgical treatment could be shown in studies comparing surgical versus conservative treatment of pyogenic spondylodiscitis . Therefore, in general, surgical treatment for spinal infections without the presence of spinal instrumentation should be performed with reservation. Operative treatment should be considered when spinal instrumentation is present, in case of neurological symptoms or imminent neurological symptoms due to bone destruction. None of the studies reported a relapse of the infection during a follow-up period that ranged from 3 months to 1 year. 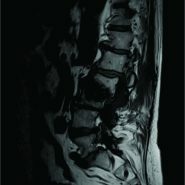 The outcome parameters reported in the different studies vary and are incomplete: Only four studies mention the serum infection markers in their follow-up, and one study mentions a “positive biological outcome.” Two studies describe the use of MRI for follow-up and two studies use radiography. In one case, a control lumbar puncture is mentioned. In our hospital, a follow-up for spondylodiscitis is performed at 6 weeks, 3 months, and 6 months after initiation of antibiotic treatment. A radiograph is performed after 6weeks to check for possible vertebral collapse, and this is repeated 6 months after treatment. At 6 weeks, 3 months and 6 months serum infection markers are checked. 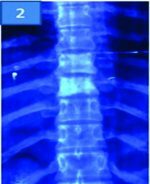 A study on long-term outcome of vertebral osteomyelitis showed that 75% of the relapses occur within 1 year after the initial illness . Therefore, we would advise a minimal follow-up period of 1 year for a reliable estimation of infection relapse. We found no literature describing spinal P. micra infections before 1986. The possible explanations for the increasing prevalence of P. micra as a cause of spinal infections could be the previously incorrect taxonomy, improved culture methods , the introduction of RapID-ANA, polymerase chain reaction (PCR; 16S rRNA gene sequencing) , and the use of MALDI-TOF MS . We expect that the detection rate of P. micra as a cause for spinal infections will increase due to the improved detection methods. The patients presenting with an acute onset of severe back pain should be evaluated for spinal infections. Especially in patients with an immunocompromised status or a recent history of dental problems, P. micra should be considered as a causative microorganism. Treatment according to the general guidelines for uncomplicated pyogenic spinal infection should be sufficient. An uncomplicated pyogenic spinal infection by P. micra can be treated according to the general guidelines. RapID-ANA, polymerase chain reaction,and MALDI-TOF MS can increase the chance of identifying P. micra as the causative pathogen of spinal infections. 1. Rutges JP, Kempen DH, van Dijk M, Oner FC. Outcome of conservative and surgical treatment of pyogenic spondylodiscitis: A systematic literature review. Eur Spine J 2016;25:983-99. 2. Duarte RM, Vaccaro AR. Spinal infection: State of the art and management algorithm. Eur Spine J 2013;22:2787-99. 3. Murdoch DA. Gram-positive anaerobic cocci. Clin Microbiol Rev 1998;11:81-120. 4. Nickles K, Scharf S, Rollke L, Mayer I, Mayer M, Eickholz P. Detection of subgingival periodontal pathogens–comparison of two sampling strategies. Clin Oral Investig 2016;20:571-9. 5. Papasian CJ, McGregor DH, Hodges GR, Kennedy J. Peptostreptococcal vertebral osteomyelitis. J Clin Microbiol 1986;24:633-5. 6. Leder KS, Barlam TF. A case of paraspinal abscess and diskitis due to Peptostreptococcus micros. Clin Infect Dis 2000;30:622-3. 7. Gonzalez MG, Montes JR, Rosado DG, Reyes SB. Multifocal hematogenous vertebral osteomyelitis due to Parvimonas micra and a subsequent pleural effusion in a diabetic patient. Reumatol Clin 2014;10:191-2. 8. Uemura H, Hayakawa K, Shimada K, Tojo M, Nagamatsu M, Miyoshi-Akiyama T, et al.Parvimonas micra as a causative organism of spondylodiscitis: A report of two cases and a literature review. Int J Infect Dis 2014;23:53-5. 9. Dahya V, Chalasani P, Ramgopal M. Peptostreptococcus endocarditis presenting as lumbar discitis in an immunocompromised patient. Am J Med Sci 2015;349:187-8. 10. Pilmis B, Israel J, Le Monnier A, Mizrahi A. Spondylodiscitis due to anaerobic bacteria about a case of Parvimonas micra infection. Anaerobe 2015;34:156-7. 11. Medina F, Tatay M, Smati M, Aoun O, Tankovic J, Bouchaud O, et al. Lemierre’s syndrome: An unusual presentation. Med Mal Infect 2015;45:328-30. 12. Endo S, Nemoto T, Yano H, Kakuta R, Kanamori H, Inomata S, et al.First confirmed case of spondylodiscitis with epidural abscess caused by Parvimonas micra. J Infect Chemother 2015;21:828-30. 13. Gahier M, Cozic C, Bourdon S, Guimard T, Cormier G. Spinal infections caused by Parvimonas micra. Med Mal Infect 2015;45:397-8. 14. George IA, Pande A, Parsaei S. Delayed infection with Parvimonas micra following spinal instrumentation. Anaerobe 2015;35:102-4. 15. Jones SL, Riordan JW, Glasgow AL, Botes J, Boutlis CS. Two cases of spondylodiscitis caused by Parvimonas micra. Intern Med J 2015;45:1090-1. 16. Tindall BJ, Euzéby JP. Proposal of Parvimonas gen. Nov. And Quatrionicoccus gen. Nov. As replacements for the illegitimate, prokaryotic, generic names Micromonas Murdoch and shah 2000 and Quadricoccus maszenan et al 2002, respectively. Int J Syst Evol Microbiol 2006;56:2711-3. 17. Murphy EC, Frick IM. Gram-positive anaerobic cocci–commensals and opportunistic pathogens. FEMS Microbiol Rev 2013;37:520-53. 18. Rousseau MC, Harle JR. Spondylitis caused by Peptostreptococcus. Clin Rheumatol 1998;17:538-9. 19. Saeed MU, Mariani P, Martin C, Smego RA Jr., Potti A, Tight R, et al. Anaerobic spondylodiscitis: Case series and systematic review. South Med J 2005;98:144-8. 20. Fraisse T, Lavigne JP, Lechiche C, Leroux JL, Sotto A. Spondylodiscitis due to Peptostreptococcus spp: A case report. Joint Bone Spine 2009;76:104-5. 21. Brook I. Two cases of diskitis attributable to anaerobic bacteria in children. Pediatrics 2001;107:E26. 22. Mougeot FK, Saunders SE, Brennan MT, Lockhart PB. Associations between bacteremia from oral sources and distant-site infections: Tooth brushing versus single tooth extraction. Oral Surg Oral Med Oral Pathol Oral Radiol 2015;119:430-5. 23. McHenry MC, Easley KA, Locker GA. Vertebral osteomyelitis: Long-term outcome for 253 patients from 7 Cleveland-area hospitals. Clin Infect Dis 2002;34:1342-50. 24. Turng BF, Guthmiller JM, Minah GE, Falkler WA Jr. Development and evaluation of a selective and differential medium for the primary isolation of Peptostreptococcus micros. Oral Microbiol Immunol 1996;11:356-61. 25. Riggio MP, Lennon A, Smith A. Detection of Peptostreptococcus Micros DNA in clinical samples by PCR. J Med Microbiol 2001;50:249-54. 26. Veloo AC, Erhard M, Welker M, Welling GW, Degener JE. Identification of Gram-positive anaerobic cocci by MALDI-TOF mass spectrometry. Syst Appl Microbiol 2011;34:58-62. 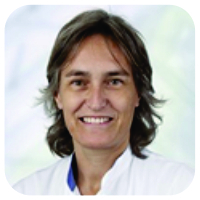 How to Cite This Article: Duijvenbode DCV , Kuiper JWP, Holewijn RM, Stadhouder A. Parvimonas micra Spondylodiscitis: A Case Report and Systematic Review of the Literature. Journal of Orthopaedic Case Reports 2018 Sep-Oct; 8(5): 67-71.